I've mentioned it before that I enjoy participating in challenges and always have a few that I return to time and time again. Lately the projects I've been working on haven't met any challenge criteria, so I've had to sit out and since that's no fun, I decided to do something about it. 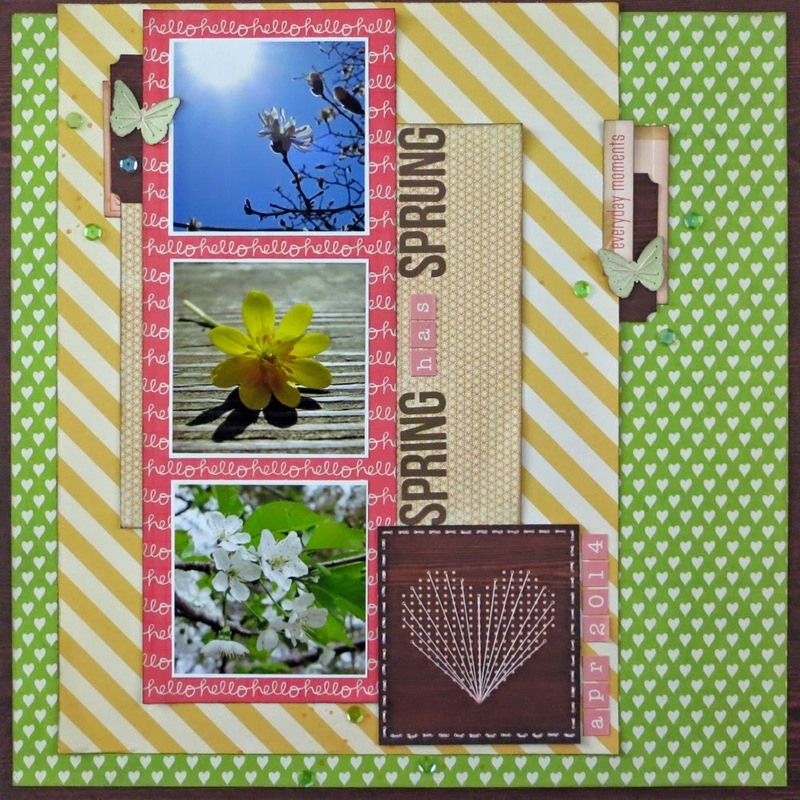 I'm playing along with the April sketch at Life.Paper.Scrapbook. 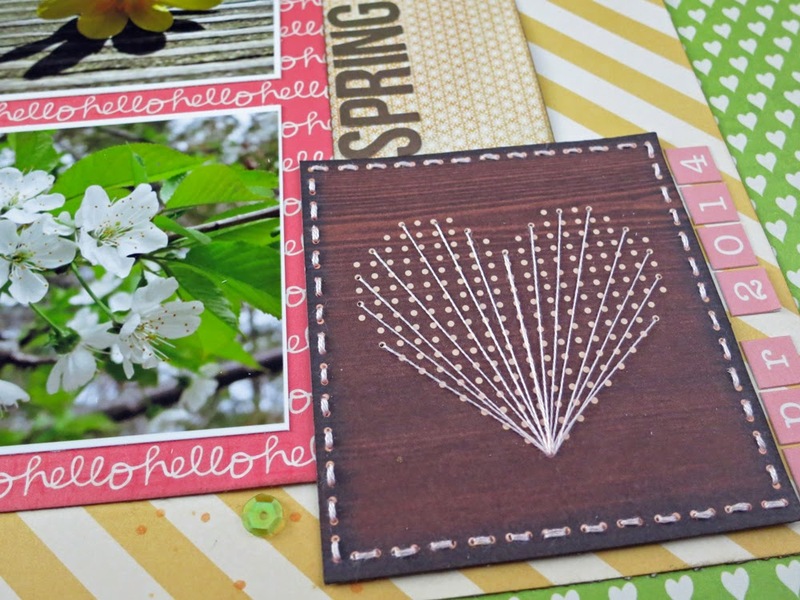 and also linking up with the Stash Busters over at Two Peas in a Bucket. Spring is in full swing in my neck of the woods and it's been a great motivator to grab my camera, go for a walk, and see what's blooming. The multi-photo sketch from LPS was perfect for some of my spring snapshots and I stayed pretty true to it. In the spirit of using up my stash, I pulled together several papers and got to layering. From bottom to top, I used Crate Paper, Echo Park, American Crafts, My Mind's Eye, and Pebbles. The combination of papers is quite different for me, but I think with the dark brown wood grain paper, it works. I inked the edges of everything, which I hadn't done in some time, and also used some sequins. I wanted to take advantage of the heart cross stitch design, but worried if I tried to stitch it, I'd wind up tearing the paper. I instead chose to thread the design in the style of string art and did it to a couple of punched butterflies as well. Your layout is amazing! I love the stitchy elements. Love all the stitching! Such a lovely layout! Wonderful take on the sketch and it's always a good feeling to use up that extra stash of supplies. The stitched heart turned out beautiful and the mix of pp works well togheter, I'd say your rocked it. I agree that the colors look great on the wood grain paper. Stashbusters definitely has some great challenges. That stitched heart is too cool! I love string art. I really loved the stitching! Very pretty! This is so beautiful, I love the bright colours and the sewing is awesome. Your layout is beautiful and a perfect take on this sketch. I love your stitched heart, so creative. So beautiful ! 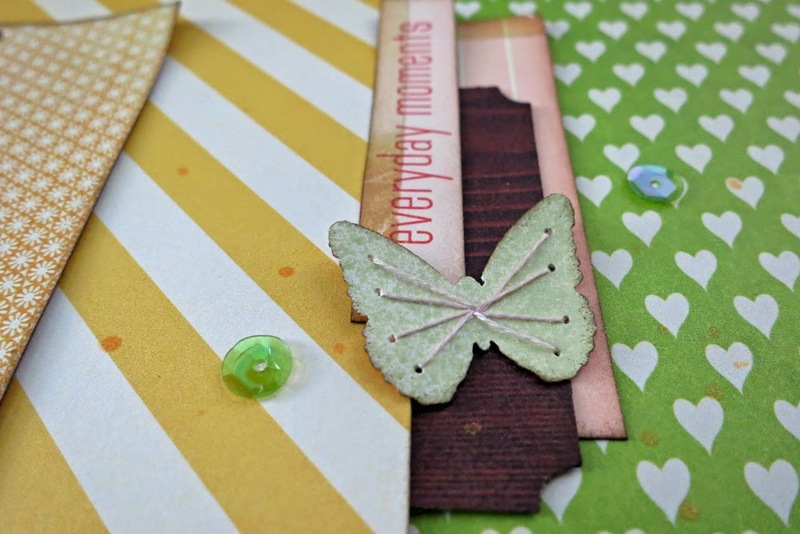 Love your stitched embellishments, especially the butterflies, such a great idea ! Love your take on the sketch, the stitched heart is amazing! This beautiful mix of patterns and colors make your photos shine, Elise! Love how you embellished too, especially with the stitched elements! Thanks for playing along with us at LPS, gorgeous layout, the woodgrain is a lovely choice.